You’re Invited … to a Rescue Reunion!! While it has been a long-time coming, we’ve finally got solid plans … and a beautiful site to hold our first ever Rescue Reunion. Right about now, you’re probably asking yourself what exactly is a “rescue reunion.” Simply stated, it is a gathering of all the families (and dogs) that have adopted from our organization. Date for the event: June 21, 2008 from 10:00 a.m. to 2:00 p.m. UPDATE ON LOCATION: Due to a scheduling conflict, we’ve reserved space at Thompson Park, located 4 blocks west of Main Street (Hwy 287) on 5th Street in Longmont. Why Longmont? We have families all over the Front Range and Longmont is the most central (not to mention it is a nice little city away from the hustle/bustle of Denver). 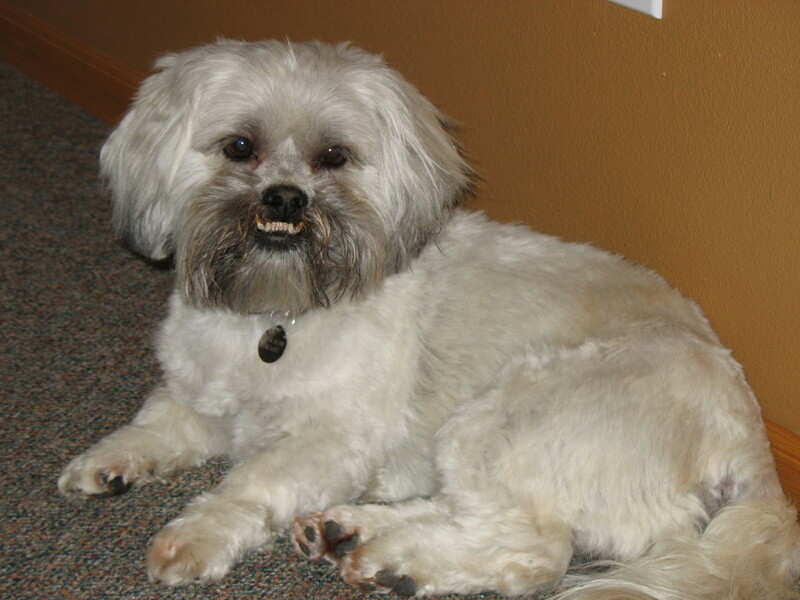 Also attending the Apso Picnic will be pet owners of FleetFireTimbers Lhasa Apsos. If you’ve been to my house, you’ve met dogs of this lineage … Frankie and Dante, to be exact. The owners of FFT dogs are as delightful as the dogs themselves. Basically this is a gathering to enjoy dogs and dog folk. We’ll have a quick grooming seminar (faces/feet/butts), a handout on current vaccination protocols, Lhasa Races with betting (actual dogs don’t race, but we think you’ll have a blast anyway), and a potluck picnic. A bit of history … Thompson Park is one of the three parks designed into the original Chicago-Colorado Colony town plat. The park is named after Elizabeth Rowell Thompson (1820-1899), a renowned philanthropist, temperance reformer and abolitionist who lived on the East Coast. A Boston reporter in 1899, called her the “founder of Longmont, Colorado”. In 1890, Judge F.P. Secor rented Thompson Park for $14 per month to graze his and a neighbor’s milk cows. The ladies of the town planted trees in the park and helped keep them alive with buckets of water from the St.Vrain — trees that still stand today and are identified in a brochure available from the Parks and Forestry Services Office (“The Trees of Thompson Park”). This will be a potluck style gathering. Please bring a covered dish and chairs. Beverages and dinnerware will be provided. We are asking for RSVPs so we have an idea of how much we’ll need to bring for both dogs and humans. Please RSVP by June 14th at (970) 663-5910 or send an email to ApsoRescue@aol.com. Sorry to have missed the Denver folks who were planning to come visit at the Golden Petco Expo. Between our schedules, pressing committments, inclement weather and gas prices, we were unable to attend. Hopefully, we’ll be able to connect with our dog families in the near future. Seeing the little ones with their new owners is apsolutely a joy! Last week we had a new arrival. An owner surrender, he was relinquished for not getting along with the 19-month old baby in the house. In keeping with tradition, he was given a Tibetan name, “Tashi,” (Ta-shee) meaning prosperity or lucky. Tashi will undergo a complete rescue exam and a neuter Monday morning as we get him ready to put for adoption. Tashi is a laid back little guy and has settled into his foster home like he’s always lived there. Almost without fail, our fosters move seamlessly from one home to the next. They live in the moment, accepting of whatever befalls them. Given love, attention and the structure of routine, they quickly adapt to their new surroundings. Tashi, a white Apso with black mask, is three years old. He gets along well with other dogs and, despite never having seen or been around a cat, does fine with Michelle’s cat. Oddly enough, we find this true of the majority of our fosters. Apsos have often been described as being “cat like” in their temperament (aloof). Perhaps they connect on some deeper level at first meeting! While Tashi is not crazy about his crate, he is crate trained … and housetrained. Yes, that is not a misprint … he is housetrained. He also loves to play ball and will entertain himself with it even after he’s worn you out throwing it for him. If you’d like more information on Tashi, please contact me at ApsoRescue@aol.com. He’s going to make someone a wonderful companion! 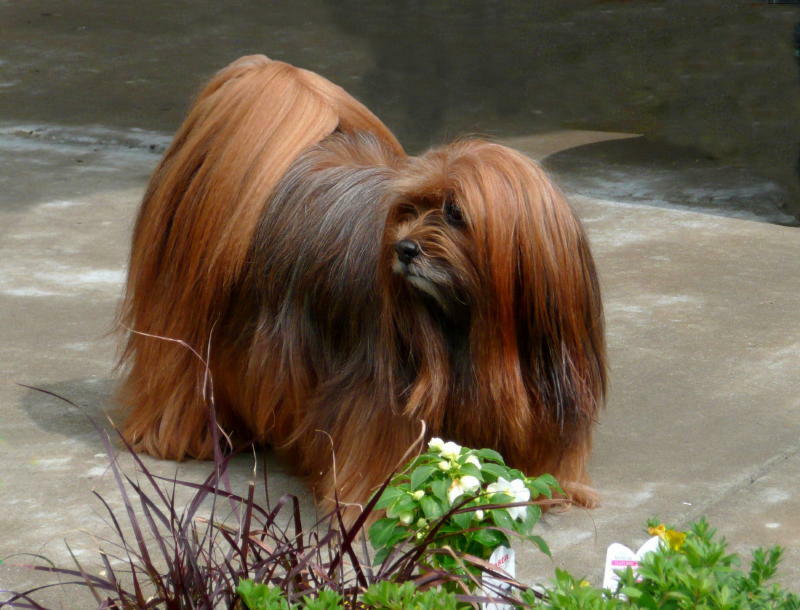 Many an Apso fancier has been intently watching the recent events unfold in Tibet, ever mindful that the breed we hold so dear teeters on the brink of extinction in its native land. The same holds true for the Tibetans, their culture and their religion which is an integral part of their day-to-day thoughts and activities. Some of us have begun protesting, both physically and monetarily. I know I’m checking labels much more closely these days for origin of manufacture. For more than a decade, I have frequently entered Tibet and often stayed there for a long time, traveling or working. I have met all kinds of Tibetans, from youngsters on the streets, folk artists, herders on the grasslands, voodoo doctors in mountain villages, to ordinary cadres in state agencies, street vendors in Lhasa, monks and cleaners in monasteries, artists and writers.Among those Tibetans I have met, some frankly told me that Tibet was a small country several decades ago, with its own government, religious leader, currency and military; some stay silent, with a sense of helplessness, and avoid talking with me, a Han Chinese, afraid this is an awkward subject. Some think that no matter what happened, it is an historical fact that Chinese and Tibetans had a long history of exchanges with each other, and the relationship must be carefully maintained by both sides. Some were angered by the railway project, and by those roads named “Beijing Road,” “Jiangsu Road,” “Sichuan-Tibet road,” but others accept them happily. Some say that you (Han Chinese) invest millions in Tibet but you also got what you wanted and even more; some say you invest in the development but you also destroy, and what you destroy is exactly what we treasure … What I want to say here is that no matter how different these people are, they have one thing in common: They have their own view of history, and a profound religious belief. For anyone who has been to Tibet, he/she should sense such a religious belief among Tibetans. As the matter of fact, many are shocked by it. Such attitude has carried on throughout their history, and is expressed in their daily lives. This is a very different value, especially compared with those Han Chinese who have no beliefs, and now worship the cult of money. This religious belief is what Tibetans care about the most. They project this belief onto the Dalai Lama as a religious persona. For anyone who has been to Tibet, it should not be strange to see the “common Tibetan scene”: Is there any Tibetan who does not worship him (the Dalai Lama)? Is there any Tibetan unwilling to hang up his photo in his own shrine? (These photos are smuggled back in from abroad, secretly copied and enlarged, not like those Mao portraits printed by the government that we Han Chinese once had to hang up.) Is there any Tibetan who wants to verbally disrepect the Dalai Lama? Is there a Tibetan who does not want to see him? Is there any Tibetan who does not want to present Hada [white welcoming scarf] to him? Other than those voices that the rulers want to hear, have we ever heard the Tibetans’ full, real voices? Those Han Chinese who have been in Tibet, now matter if one is a high official, government cadre, tourist or businessman, have we all heard their real voices, which are silenced, but are still echoing everywhere? Is this the real reason that all monasteries in Tibet are forbidden from hanging up the Dalai Lama’s picture? Is this the reason that all work units have officials to check in every household and to punish those who hang up his picture? Is this the reason that the government has people to stop those believers on the pilgrimage path on every religious celebration day? Is this the reason for the policy barring government employees from having their children study in Dharamsala; otherwise, they will be fired and their house will be taken away? Is this the reason that at all sensitive times, government officials will hold meetings in monasteries, to force monks to promise to “support the Party’s leadership” and “Have no relations with the Dalai splitist cliques”? Is this the reason we refuse to negotiate, and constantly use dehumanizing language to humiliate him? After all, isn’t this the very reason to reinforce the “common Tibetan scene,” making this symbol of nationality more holy? Why can’t we sit down with the Dalai Lama who has abandoned calls for “independence” and now advocates a “middle way,” and negotiate with him with sincerity, to achieve “stability” and “unity” through him? This group of people who believe in Buddhism because they believe in cause and effect and transmigration of souls, oppose anger and hatred, developed a philosophy that Han nationalists will never be able to understand. Several Tibetan monk friends, just the “troublemaker monk” type that are in the monasteries explained to me their view on “independence”: “actually, we may well have been ethnic Han in a previous incarnation, and in our next incarnation we might well become ethnic Han. And some ethnic Han in a previous life may well have been Tibetan or may become Tibetan in their next life. Foreigners or Chinese, men or women, lovers aand enemies, the souls of the world transmigrate without end. As the wheel turns, states arise and die, so what need is there for independence?” This kind of religion, this kind of believer, can one ever think that they would be easy to control? Yet there is a paradox here: if one wants them to give up the desire for independence, then one must respect and protect their religion. Of course behind those posts, there are an overwhelming number of posts from Han ” patriots.” Almost without exception, those replies are full of words such as “Kill them!” “Wipe them out!” “Wash them with blood!” “Dalai is a liar!” – those “passions” of the worshippers of violence that we are all so familiar with. In the last week, after I put down the phone which cannot reach anyone on the the other end, when I face the information black hole caused by Internet blockage, even I believe what Xinhua has said – strangely I do believe this part: There were Tibetans who set fire to shops and killed those poor innocent Han Chinese who were just there to make a living. And I still feel extremely sad. Since when were such seeds planted? During the gunshots of 1959? During the massive destruction during the Cultural Revolution? During the crackdown in 1989? During the time we put their Panchen Lama under house arrest and replaced him with our own puppet? During those countless political meetings and confessions in the monasteries? Or during the time when a seventeen-year-old nun was shot on the magnificent snowy mountain, just because she wanted to see the Dalai Lama? Why can’t you understand that people have different values? While you believe in brainwashing, the power of a gun and of money, there is a spiritual belief that has been in their minds for thousands of years and cannot be washed away. When you claim yourselves as “saviors of Tibetans from slavery society,” I am ashamed for your arrogance and your delusions. When military police with their guns pass by me in the streets of Lhasa, and each time I am there I can see row upon row of military bases. yes, I, a Han Chinese, feel ashamed. What makes me feel most ashamed is the “patriotic majority”: You people are the decedents of Qinshi Huangdi who knows only conquering by killing; you are the chauvinists who rule the weak by force; you are those cowards who hide behind guns and call for shooting the victims; you suffer from Stockholm Syndrome; you are the blood-thirsty crazies of an “advanced” culture of Slow slicing and Castration. You are the sick minds waving the “patriotic” flag. I look down on you. If you are Han Chinese, I am ashamed to be one of you. Tibet is disappearing. The spirit which makes her beautiful and peaceful is disappearing. She is becoming us, becoming what she does not want to become. What other choice does she have when facing the anxiety of being alienated? To hold onto her tradition and culture, and revive her ancient civilization? Or to commit suicidal acts which will only add to Han nationalists’ bloody, shameful glory? Yes, I love Tibet. I am a Han Chinese who loves Tibet, regardless of whether she is a nation or a province, as long as she is so voluntarily. Personally, I would like to have them (Tibetans) belong to the same big family with me. I embrace relationships which come self-selected and on equal footing, not controlled or forced, both between peoples and nations. I have no interest in feeling “powerful,” to make others fear you and be forced to obey you, both between people and between nations, because what’s behind such a “feeling” is truly disgusting. I have left her (Tibet) several years ago, and missing her has become part of my daily life. I long to go back to Tibet, as a welcomed Han Chinese, to enjoy a real friendship as equal neighbor or a family member. The following is an article by Cindy Cooke as published on the UKC site (United Kennel Club). If you think this can’t happen in your city, you’re wrong … dead wrong. Pay particular attention to the ordeal an ethical/responsible breeder (and rescuer) was subjected to and how the City of Littleton, Colorado basically held a gun to his head, including forcing property inspections outside the City’s jurisdiction!! Vickie, you are absolutely right! Everyone needs to pay attention! I know Bob. Bob is someone like me. Long time breeder. Long time exhibitor. And, unlike me, a long rescuer of all Setters. He is a responsible, ethical, compassionate breeder. There is lots of literature available on the hijacking of our rights, including our rights as dog owners. Our personal rights are being hijacked in the name of ’safety for our country’. Our rights as dog owners are being hijacked in the name of …well, you tell me. These rights have slowly, stragically been eroded by animal extremists. For example, Boulder was the first city in the country to change verbage in city laws from pet owner to pet guardian. Guardian implies animals have rights. Animal welfare is one thing. Animal rights is entirely different. There are organizations that support animal welfare. Make sure your support, your contributions are going to organizations that represent your views. PETA and HSUS are dog owners two biggest enemies in our country. People for the Ethical Treatment of Animals. Humane Society of the United States. The names sound grand. After all, what kind of person isn’t for the ethical treatment of animals. What kind of person doesn’t support being humane to animals. Both of those organizations have slowly, ever so slowly, eroded people’s rights with their dogs. Cindy Cooke does not exaggerate in her excellent article. Pay heed! Tomorrow, if all goes as planned, “Bentley” will become the latest foster in rescue. An unneutered three-year old, he will be looking for a new home that can spend more time with him. While we gather as much information as possible on our intakes, there’s always the unknown. How will he do with other dogs … how will he come through his neuter … how will he react to his first grooming in rescue … what will he think of the resident felines … will he sleep through the night … is he *really* potty trained and crate trained … does he like children or do we need to find a home that limits his contact with toddlers … is he a hearty eater or a picky one? So many questions!! These little ones arrive in rescue and we treat them just as one of the pack. They are expected to behave and, with training (some more, some less), they usually live up to our expectations. They thrive on attention and structure. It isn’t long before they settle in … and it’s like they’ve been here their entire lives. Every now and again, a foster will return for an extended visit. They walk through the door and move seamlessly from their house to ours again, like they never left. I used to think my dogs couldn’t live without me — wishful thinking on my part. After all the fosters that have passed through my home, I’ve come to realize the canine is much more adaptable than we give them credit for. Indeed, it is this adaptability that has ensured their survival through the ages! Welcome, Bentley … we look forward to getting to know you. UPDATE: Well, things *didn’t* go as planned, unfortunately, and, for the time being, Bentley will not be entering rescue. Bentley managed to run away from home on the eve he was to arrive in rescue. We hope he finds his way home again, safe and sound. If anyone happens to find a little grey/white Apso in Lochbuie, Colorado, please contact us! You’ll notice something new with the Blog … actually, that would be “hear” something new. We’ve added a playlist to our Sonific widget. If you scroll down a tad, that’s the little music player on the right … a “widget.” It shows the album cover, the song playing at the moment and has controls for play, stop, volume and advance. If you don’t like the song currently playing, click on the button with the arrows and see what comes up next. Or you can simply stop the player. Update: Hmmph … wouldn’t ya know it. We just get it all set up and then Sonific leaves the ‘Net as of May 1, 2008. So what you hear is … nothing! “Furbaby” … the word sends chills up my spine. While we love our four-legged companions dearly, we must never lose sight of the fact our canine companions are a species unto themselves. Many of the surrenders we get into rescue are there because the owners lovingly, yet mistakenly, anthropomorphize (attribute human form or personality to things not human) these cute little dogs, not realizing that the Apso is one of the most dominant dogs in a small package. Give them an inch and they will take a mile … you can bet on it! At a recent show, I was dumbstruck by the sight of a girl walking a Chihuahua fully attired in a flowered sundress with matching bonnet. While many folks saw the embodiment of cute, I was appalled. In my opinion, this dog didn’t look cute — just plain foolish. Unfortunately, this notion of turning our dogs into furry people appears to be growing out of control. We see them sporting the latest fashions, pushed in strollers, and slung in totes. Day care, therapists, and even pet psychics are available. Dogs are not people! Yes, we do have some traits in common. However, a trait or two does not a human make, and when we expect our dogs to act accordingly, we set them up for failure. Dogs are thinking, emotional beings but not in the same ways we are. Their lives are governed by instincts with which we cannot reason. While we strive to provide them with the best of nutrition, they are still predators born to the chase. We should not be surprised when they go for a cat, squirrel, or even another little dog that crosses their path. We should not be offended when our intact male dogs makes eye contact and bristles at another boy. It doesn’t necessarily mean they have a poor temperament or are aggressive. They are males with the male need to defend their territory against a possible sexual interloper. We can train and socialize our dogs to the best of our abilities but, in the long run, genes will win out. Yes, I believe in training and socialization. We cannot allow our dogs to mark their territories in our homes, bark incessantly, or run loose, terrorizing the neighborhood. However, training should be tempered with the understanding that in certain circumstances, nature will take precedence. Anyone who has had an intact male dog living with a female in season knows no amount of reasoning will calm his need to breed. You either live with the howling, slobbering, barking and panting — or temporarily relocate one of the parties. Telling him “next time” or “not this girl” will not appease him. Dogs are unique in the animal world. No other creature has ever been designated “man’s best friend.” There’s something special in the makeup of a dog that has earned him this one-of-a-kind title. It is his joie de vivre, his unconditional love, his unswerving loyalty? Yes, yes, and yes. Dogs are all these things and more, because their joy, love and loyalty are not contaminated by human traits of bitterness, vindictiveness and betrayal. By attempting to remake them in our image, we are demeaning the very character of the dog. Think of it this way: How exciting and fascinating is it to be able to develop such an intimate relationship with an entirely different species? Let’s celebrate those differences and try to look for the good, savor the moment, be content with what we have, and who we are. In this way, maybe we can both, as species, become a bit better than we would be without each other. ~~ J.W.